These colourful chocolate gifts make an eye-catching treat for small children. They’re so easy to make and needn’t be perfectly shaped to look effective. Cover two baking sheets with baking parchment and place 6 lolly sticks or disposable chopsticks, spaced well apart, on each. Spoon a third of the milk chocolate and a third of the white chocolate into the corners of 2 small, new plastic food bags. Squeeze the milk chocolate right into the corner and cut off the merest tip with scissors, so the chocolate can be piped in a thin line. Pipe petal shapes onto the ends of half the wooden sticks, making sure that the centre of the flower is level with the top of the stick. Pipe more petal outlines over the remaining sticks using white chocolate. Fill the mugs with Smarties or mini eggs. 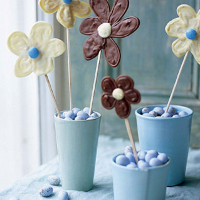 Peel the paper away from the chocolate flowers and push 3 lollies into each mug. Loosely wrap the mugs in clear Cellophane or gift boxes and tie with ribbon.